This is a simple, ready-in-no-time, dinner recipe. It's based on a Donna Hay recipe I clipped and filed away in a display folder many moons ago. It's got enough veggies to be healthy and enough taste to be a family favourite. If your kids don't like spice, replace the chilli with paprika, or omit altogether. You can use chicken mince and chicken stock instead of the beef or use a jar of pasta sauce instead of the passata (tomato puree). You can find it in all supermarkets and it is pure tomato, whereas the other jars tend to have added sugar and salt. 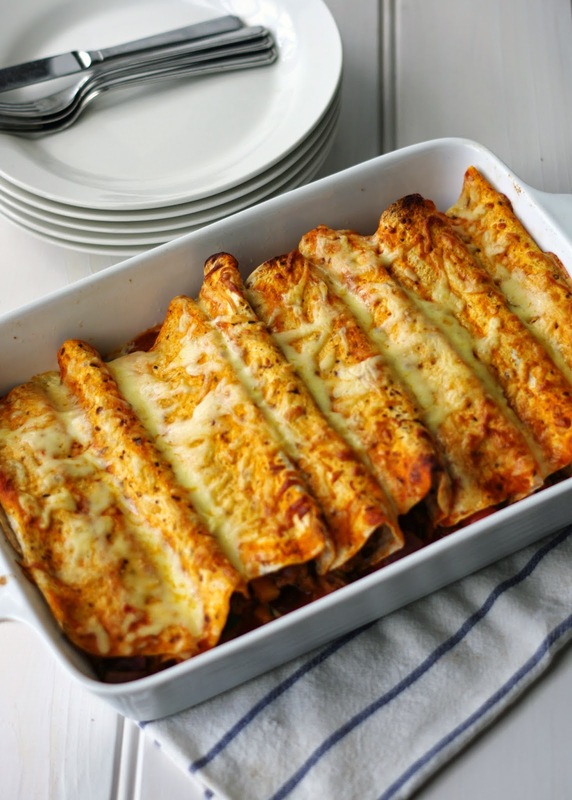 If you want a creamier top, spread some Greek yoghurt or sour cream on top of the enchiladas before you finish with the cheese. 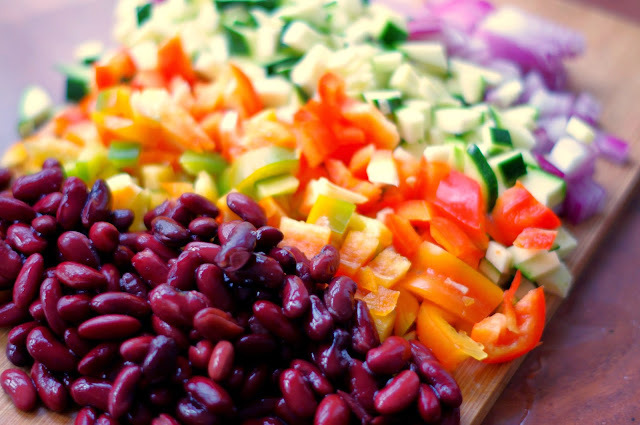 Do try the kidney beans and lentils, they don't change the taste, but they do improve the nutritional value. If you think your kids might be resistant to eating them, try mashing/blitzing them first so they just blend in with the mince. Preheat oven to 200 degrees Celsius. Heat 1 tbsp oil in a fry pan over medium heat. Add onion, garlic, cumin and chilli to pan and cook for 5 minutes. 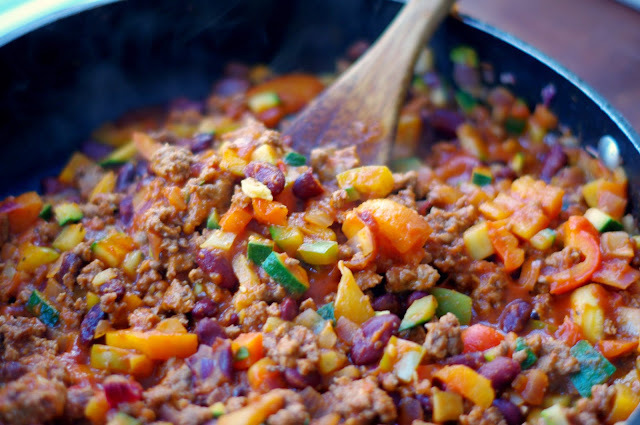 Add beef mince to pan and cook until golden brown. Add capsicum, zucchini, kidney beans and lentils to meat and cook for further 3 minutes. Add beef stock and 500ml of tomato passata, reduce heat to low and simmer for 20 minutes. Lay out wraps and divide mixture evenly between the 8 wraps. Roll each wrap and place seam side down in baking tray sprayed with cooking oil. Spread the remaining passata over the top of the wraps and top with cheese. 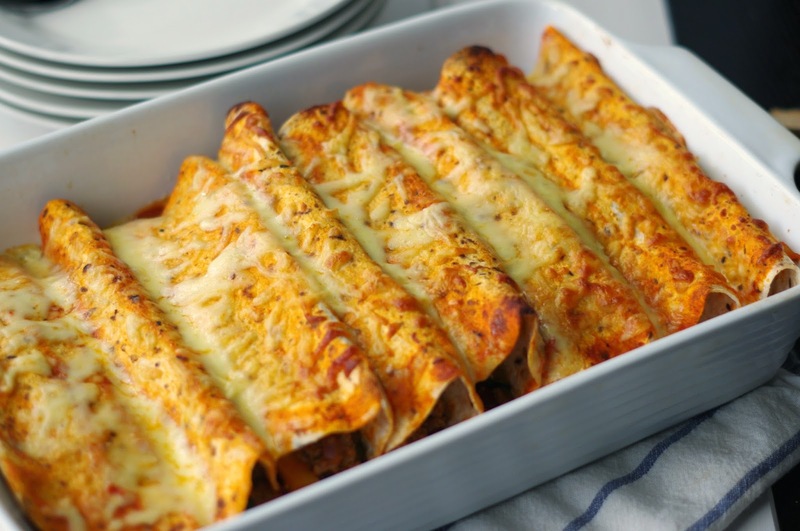 Do yo prefer chicken or beef enchiladas? Oh Danielle, these look great! These enchiladas look delicious! I've never tried adding lentils to mine so I'm definitely bookmarking this recipe. I tend to add lentils or some form of legume to any meal that uses mince. It's such an easy and cheap way to add an extra serving of veggies to a meal.